FYN attended a Memorial Day Service held Saturday morning at 10 am in Fannin County at the Fannin County Veterans’ Memorial Park. There were many Veterans along with family members present to honor our Military and remember the many brave in Service that have fought and continue to fight for our Freedom. Austin Vest did a great job as he sang our National Anthem; Austin is the son of Edward and Lisa Vest. There was also a check presentation in the amount of $250 for the Boy Scouts to help pay for some of the Scouts to attend camp. 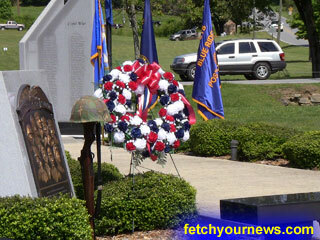 Memorial Day Service – Blue Ridge, GA from Fetch on Vimeo. Ret. Lt. Col. George Pletcher was the announcer of the ceremony. The Service began with the posting of the colors. US Flag- Paul Hunter, VFW Flag-Richard Pierce, Legion-JC Wood, DAV Flag-Bobby Flowers, AM Vets-Joe Wells, and Legion Aux-Charlotte Hunter. The placing of the wreaths- Skobie Matunde and Homer Kupla. Rifles and Helmets – Left – Gene Martin and Richard L. Crosley, Right-Dennis Rich and Mr. Horton. The Bugler – Robert Brown, Rifle Squad Comm.- Charles Head. The Firing Squad – L-R, Vic Vanderfrif, John Waters, Skobie Matunde, Richard Crosley, Bobby Flowers, Joe Wells, Richard Pierce, Gene Martin, Dennis Rich, and George Andrin. FYN was honored to speak with Charles Cook following the ceremony, Mr. Cook is a Veteran of World War II, the Korean war, and the Vietnam war. When FYN asked for tips on “staying young”, the 87 year old told us to “stay in shape” sounds like great advice. FYN would like to thank everyone, who has served or is currently serving, for their Service. May God Bless our Military.